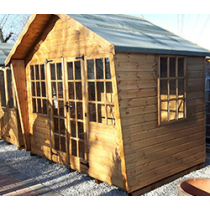 Summerhouses are becoming increasingly popular as a way to get some more space and spend more time outside, whatever the weather. Whether it’s a ‘man cave’, homes office, hobby room or Mum’s sanctuary, summer houses can be painted and personalised to suit the individual. With insulation and power they can be used throughout the year. With the increase in flexible working and the rise in remote access, home offices are becoming a way to cut down on lengthy commuting and spend more time with family and friends. Estate agents say a well-built garden office can add as much as 5% to the value of a house and often planning permission is not needed. On our show site, we have a range of summer houses and our helpful staff can discuss your specific requirements with you. See our photo gallery for some of the ‘Beautiful Broadoak Buildings’ from 2015. New models arriving in Spring 2016 – come and have a look!